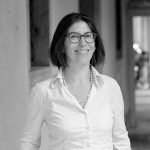 Giulia Albanese graduated in History at Ca ‘Foscari University in Venice in 1990 and was awarded a doctorate at the European University Institute (EUI) in Florence in 2004. She was a fellow at the Italian Institute for Historical Studies in Naples ; Postdoctoral and Research Associate at the University of Padova; Jean Monnet Fellow at the European University College in Florence. She has been a member of the editorial office of the journal “Mestiere storico” (2002-2010), she is part of the editorial team of “Storica” (2008) and “Snodi” (since its foundation in 2007). Since spring 2012, she has been a member of the Board of Directors of the Istituto Nazionale per la Storia del Movimento di Liberazione in Italia – Insmli (National Institute for the History of the Liberation Movement in Italy). She collaborates steadily with the Istituto veneziano per la storia della resistenza e della società contemporanea – Iveser (Venetian Institute for the History of Resistance and Contemporary Society), of which she is currently vice-president.